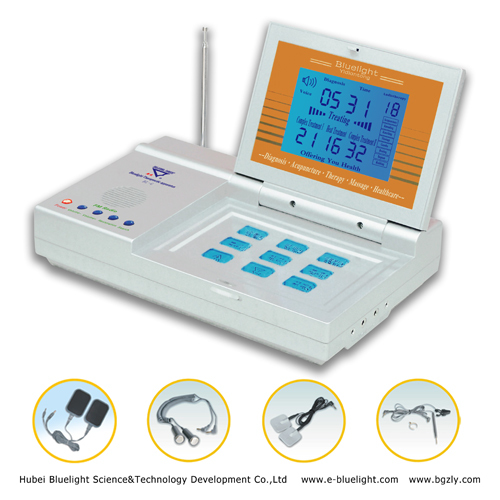 BLUELIGHT BL-G modelElectro Acupuncture (also known asBLUELIGHT Diagnosis and treatment instrument, Multifunction home health care)uses the most advanced digital chip to reach more functions, including five treatment chanels, both diagnosis and treatment functions and easy to operate. It is popular in China called “family doctor”, and described as "a machine in hand, no health worries”. BL-G BLUELIGHT Electro Acupuncture uses high-tech electronic technology Integrated with the traditional chinese medicine meridian theory, response on behalf of the human body organs and parts of each of the corresponding hand, ear representative points (ie, hand hole, ear hole) for detection. It can be quickly detected of human organs and other parts of the early lesion within a few minutes, including the detection of malignant tumors, hands, ears with the detection of Accuracy rate of 95% or more, so that we can prevent potential disease. BL-G BLUELIGHT Electro Acupuncture supplies electrical pulses, comprehensive treatment I, comprehensive treatment II, far-infrared heat , five chanels treatment and Two-way hand-ear output of the characteristics of diagnosis, Treatment time can be freely set within 32 minutes. BL-G BLUELIGHT Electro Acupuncture has function of iacupuncture, massage, percussion, massage, Scrapping, beat, cupping, kneading, which can be separated from an integrated operation system. BL-G BLUELIGHT Electro Acupuncture possesses previous electrotherapy, magnetic therapy, massage,chirapsia, acupuncture, cupping, qigong, far-infrared heat, water, hand, foot and reflection of electromagnetic therapy, moreover, it has additional value for treatment with hands, ear and a variety of exercises two-way integrated and stand-alone treatment of 13 major treatment. BL-G BLUELIGHT Electro Acupuncture has High/medium/low frequency which is more suitable for different people to appreciate the course of treatment. 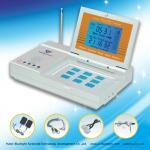 BL-G BLUELIGHT Electro Acupuncture has voice prompt functions, you can operate machine easy with clear and sofe voice. BL-G BLUELIGHT Electro Acupuncture has Imported LCD screen, large, legible, highly reliable, readily available all of its effectiveness. BL-G BLUELIGHT Electro Acupuncture also has a FM radio receiver, you can use search button to find the frequency you want, it is nice to listen to radio after treatment. Electromagnetism Contactor, Electrode Slice, Detective Ring ,Electro-Eardrum , Diagnosis Pen Detector , Position Fix Clip for Shaoshang Acupoint,Massage eye patch, massage shoes etc. Good day i am interested in the product you are selling.I will like to know more about the price and specifications. this machine is so nice ,with so many function ,and cure my back pain almost well ,i must say thanks for your bluelight therapeutic apparatus ,i will ask my friends buy from you ! pls send me operation manual for this device, i have to know how to use before buying, thanks! I wish eveything is OK.
capitulum ?) I had an operation but still had pain. For the first time I was able a good night sleep. Thank you!Hope more and more people know and use our products.